A review of the Asics Motion ID gait analysis service and rant about companies ripping people off. 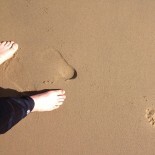 Reflections on the awkwardness of running barefoot wrt. civic duty. A really easy approach to using a heart rate monitor in your training. Shhh…. dont tell a soul: this is really about running bags and commuting. Refelections on a friend’s attempt at Everest. On how I stumbled 50k through London. My little mid life crisis and running. hundred up: running without leaving the house. injuries, running, blah blah blah. Why David Bradford’s article is annoying. I’ve found the shoes I’ve been looking for. Registering at the trail head, leaving fear on the tarmac and entering the heart of darkness. I meant to write about Malaysia, but wrote about London instead. Falling out with my body, one knee at a time. A review of the Maffetone Method. Easy running, low carb diets and dreadful typography. The end of my longest streak ever. Do a running streak, running streaks are amazing. #runeveryday: train over for October. 31 day running streak anyone? More running naked through the woods. A review of McDougall’s latest book: a bit silly, but still highly recommended. On almost finishing the second half of capital ring. Compression stockings, face sitting and tubes of fabric that cost £30. An amazing run. The necessity of aching, exhausted legs. Why I run, why other people run. Thinking about running, but not in so much depth it stops being fun. hopefully. You have got to get these all up in your headphones. Public swimming pools and the double edged sword of twenty pound goggles. Reflecting on a run in Glasgow. I’ve been thinking about my race schedule this summer, especially whether I am going to try to run an ultra. Reflecting on stuff which is hard, and stuff which isn’t, and mostly what it feels like when you land on stuff which is with force. Parker’s heart rate training program laid bare. or not. Oxymorons aplenty, reviews of some of the barefoot shoes I’ve tried. Inov8 F-lite, Merrell Trail Gloves, no shoes at all: it’s all here. New Year resolutions and what 2015 has in store.